Generally, concrete in a structure cures at a MUCH faster rate than concrete in a test cylinder. This is due to the much larger mass of the structure, and better hydration which aids curing. When determining the early-age strength of cast-in-place concrete, reliance on test cylinders can lead to problems. For example, if test cylinders are cured at a lower temperature than the structure, the cylinders would underestimate the strength of the slab, which means that critical construction operations are delayed unnecessarily. Or conversely, if the deck is cooler than the cylinders, the cylinders would overestimate the strength, a clear safety concern. Maturity testing monitors the curing of the structure and compares it to the cylinder, to more accurately track strength gain in the structure, improving both safety and construction operations. Maturity Testing has been a recognized ASTM Standard practice (C1074) for over 20 years. A complete Con-Cure System consists of 4 basic components: Maturity Meters, Sensors, Software and Training. These devices are used to collect information about the curing history of concrete. Con-Cure meters are programmable to record concrete temperatures at user-selectable intervals, and offer a variety of launch options for user convenience. They are smaller than a pack of cigarettes, weigh less than 2 ounces, run for about 4 years on a single battery and are well protected from the rigors of construction sites. Con-Cure meters are high-tech devices cloaked in a decidedly low-tech box to deter theft. The information is transferred to the software via a simple download cable (included). At Con-Cure, we have always required the highest accuracy in all facets of our testing. For this reason, and others, we use thermistor sensors (as opposed to thermocouples). Our sensors are pre-calibrated, epoxy-tipped and reusable. They are accurate to 0.1° C over a wide range of temperatures, and are far superior to thermocouples in many respects. The sensors connect to the maturity meters without tools. The heart of the system is the remarkable CMT Software. From launch to readout and reporting, CMT is without question the best maturity software available. Many features set it apart, including being able to correct for various measurement parameters on the fly, merge maturity information, and a lab data entry form that is deceptively simple to use. Each feature was created to make maturity testing as accurate, simple and error-free as possible. We provide the only one-day, on-site training and certification course in the use and applications of maturity testing available. Given our years of experience in conducting this test, we provide customers with all of the tools they need to begin doing maturity testing immediately, without the typical “learning curve,” thereby dramatically impacting the ROI. The sensors are placed in the structure by drilling a small hole in the formwork and threading the sensor plug through the hole. The meter is attached below. The sensors can be located anywhere in the structure--wherever the structural engineer might want specific information. Usually, they are located in the flatwork where coolest temps are expected. Here, the sensor tips are protected from damage during placement operations by securing the wire and sensor to the underside of the rebar. There is no limit to the number of meters that can be deployed for a given pour. Here you can see a view showing the sensor and meter together. 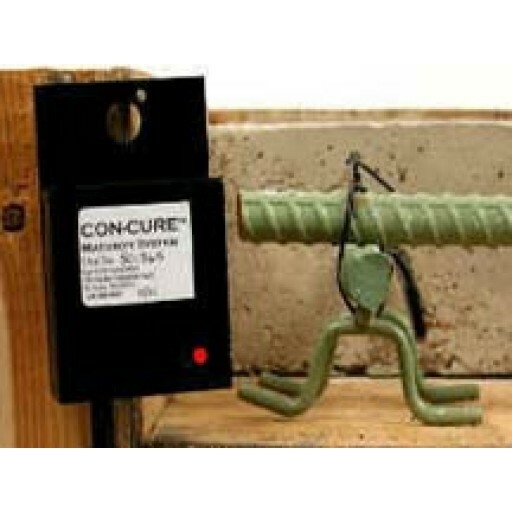 The sensor tip is attached to the rebar and the wire runs through the formwork down to the Con-Cure meter below. The Mobile Lab downloads the information from the meter, calculates a strength, & redeploys the meter for continued monitoring. Full printouts of temperature and maturity data for each sensor are provided, on-site, at the time the readings are taken. Con-Cure™ maturity meters are housed in a protective case. and have a ±0.1°C accuracy. with secure logon and 3 permission levels for administrative control.